[vc_row][vc_column][vc_column_text]Under-eye circles are a huge pain. No matter how hard you try, it can feel as though the blue and red hues that make-up those pesky dark circles peek through even the most pristine make-up. If you’ve been in Debony Salon, you know we’re loyal to jane iredale and our beauty gallery proves it. We love their extensive line of make-up, which has multiple solutions to under-eye circles. We share a few of our favorites and when and how you should apply them into your make-up routine! 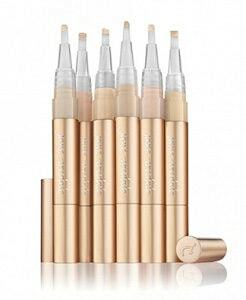 [/vc_column_text][/vc_column][/vc_row][vc_row][vc_column width=”2/3″][vc_column_text]Circle/Delete is an under-eye concealer that brings moisture to the eye, where there are no sebaceous glands to be found. It’s nourishing, made with Moringa butter, a power house when it comes to shuttling moisture to your under-eye skin. This also helps to soften fine lines around the eyes, creating a smoother appearance. [/vc_column_text][/vc_column][/vc_row][vc_row][vc_column width=”2/3″][vc_column_text]Active Light creates a bright and wide awake look, by its ability to refract light. Active Light also plays multiple roles in its ability to work as a contouring agent around your nose and chin as well. Its multi-use highlighting ability makes it a great tool to have in your tool-box. Both come in different tones to help cancel out common under-eye discoloration. Circle/Delete has three colors; No. 1, 2, and, 3. No. 1 neutralizes redness, No. 2 neutralizes blue, violet & grey, No. 3 neutralizes brown and black in darker skin tones. The line of Active Light is comprised of six concealers. No. 1 and No. 2, have a yellow base which helps to cancel out redness under the eye; while No. 3 and No. 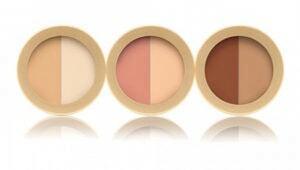 4 concealers have a peach base, which neutralizes blue, violet and grey. Active Light No. 5 and No. 6 has a base of yellow/brown, and, neutralizes redness in darker skin tones. No.6 neutralizes brown and black in darker skin tones, with an orange/brown base. 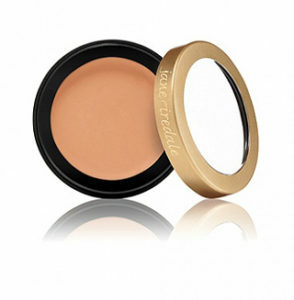 Circle/Delete is an eye conditioner, in addition to a concealer. The Moringa Butter in this product, moisturizes and conditions, as well as works to soften fine lines. Because the under-eye area is void of oil-producing glands, having this added moisture through Circle/Delete is a huge benefit. Active Light has Titanium Dioxide, which acts as an SPF, providing sun protection. Active Light also refracts light, meaning that it’s not a great option for those being heavily photographed. We love Active Light for everyday use, but we don’t apply it on brides or for those getting ready for a photo shoot. The flash from the camera would hit the Active Light and create a glare that would wash one’s face out. 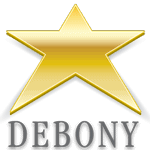 [/vc_column_text][/vc_column][/vc_row][vc_row][vc_column][vc_column_text][/vc_column_text][/vc_column][/vc_row][vc_row][vc_column width=”2/3″][vc_column_text]For those with bruising or hyper-pigmentation, Jane Iredale has created Enlighten. It’s rich in anti-irritant and anti-oxidant properties and it also helps to brighten the look of tired eyes by reducing the appearance of dark under eye circles and puffiness.